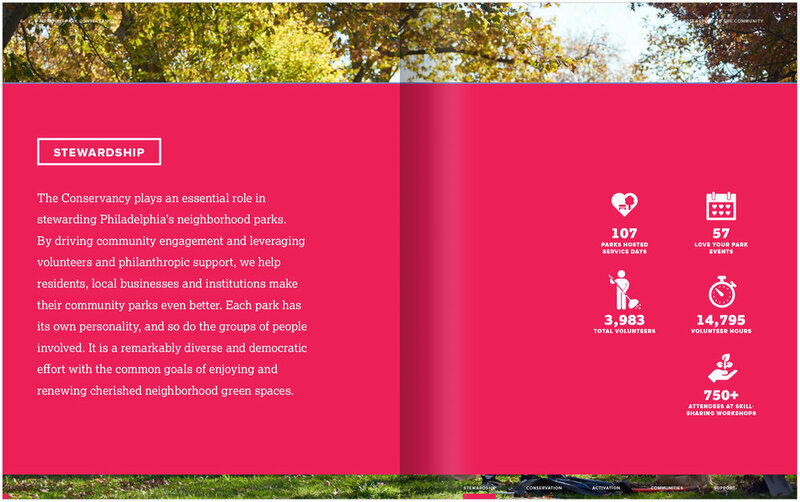 Fairmount Park Conservancy provided me the fun task of creating a flexible and spirited template for their annual reports, beginning with their 2016 Report to the Community. Color-coded sections and persistent indices divide the reports into the Conservancy's areas of focus. Solid, saturated colors provide visual punctuation and contrast the reports’ photo-rich layouts. Shown above are spreads from both the 2016 and 2017 annual reports. ASB is a human services organization that acts as a liaison for those in the Philadelphia region facing blindness or loss of vision, with a core mission to promote independence. The 2017-2018 Fiscal Year Report to the Community reflects a reinvigorated approach to their communications. ASB presented me with the creative challenge to design a document that both functions flawlessly for non-sighted readers and provides an immersive experience for sighted readers. Layers of content float along with photography that focuses on the ASB community in a scrollable PDF; all within an infrastructure that makes the PDF compatible with JAWS screen readers. Written by Alison Rooney Communications with photography by Steve Legato. Narrative about ASB’s core services is interrupted with “Staff Spotlights” that feature the devoted and eminently talented staff and volunteers at ASB. For Philadelphia LISC ’s 2017 Annual Report, a dynamic and photo-packed layout reflects the energy and devotion LISC brings to its investments in the Philadelphia community. Within this 12-page layout, slightly tilted layers are a simple gesture that energize and “scale up” the design beyond the page, while a persistent sidebar loaded with statistics make this a short, but impactful, read. With a devoted community, strong academic associations, and significant private investment, the city of Camden, New Jersey, is recultivating a sustainable and animated identity. 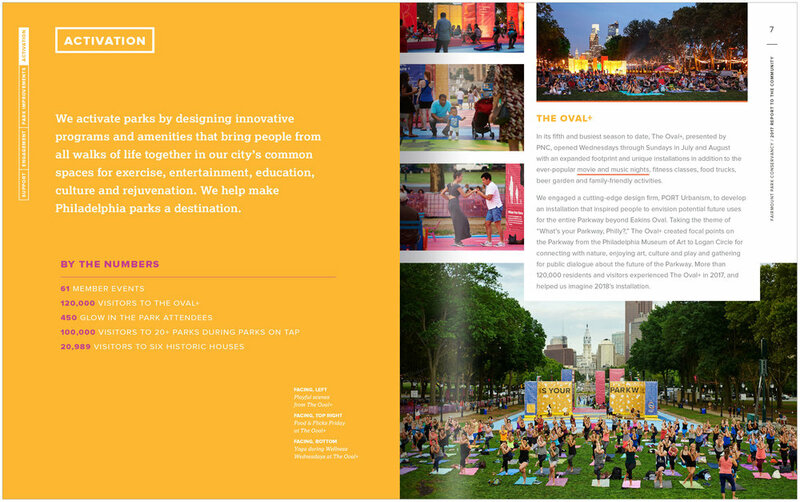 The 2015 annual report provides a balanced and vibrant layout to reflect their bright future. Camden-centered themes—"Work Camden," "Play Camden," Invest Camden"—organize the report into a vividly-colored narrative that presents text and spirited photography with small infographics, case studies and energetic maps. The project also included the design and print oversight for materials related to their 2015 annual meeting, including a save the date, printed invitation, and event program.